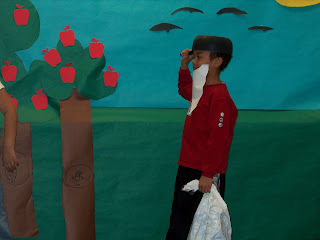 I went and saw Kobi’s little play he had at school about Johhny Appleseed. It was really cute. It was so cute seeing him shy because he is definately not normally. I love being able to attend any of his activities. He just light up when I am there. He is getting so tall. Wow! What grade is he in? How cute! It looks like he got the leading role.